To say Coreen Cordova is a colorful personality is an understatement. Her home, her design studio, her wardrobe, are all awash in brilliant hues that make you smile. Not surprisingly, she is also an Accidental Collector. Although some collectors find their passion and delve deeply in one area, there are others who find something fascinating in everything they see and touch. They’re explorers on a grand scale, often with multiple collections that reflect their grand curiosity. Coreen is an explorer extraordinaire. Before I show you her passion that became her profession, let’s peek inside her casita, which is truly a magical wonderland. Children who visit never want to leave, and often cry when they have to go home. 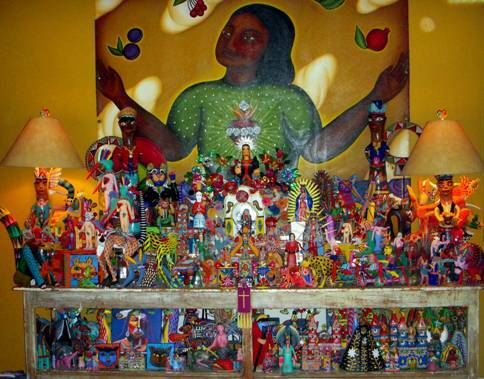 One wall in the living room is a showcase for her hand painted animals and religious figures from Oaxaca. What at first may seem overwhelming is actually meticulously organized. Note in the photo below how the madonnas, angels, and santos have congregated in their own little corner of heaven. 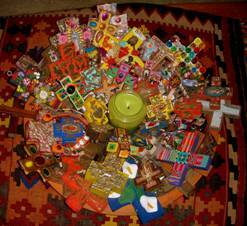 Coreen can instantly retrieve each piece, tell you their story, and why they’re placed where they are. Over the mantle, an assemblage of fanciful faces on 3D blocks wonder at their good fortune in finding such a perfect home. Coreen could not possibly expect one lone portrait to anchor the mantle. Who would it talk to? 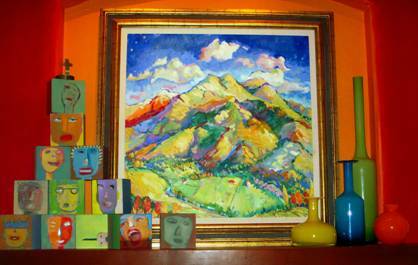 So she purchased a quartet, and continues to add to the tribe on subsequent visits to San Miguel. 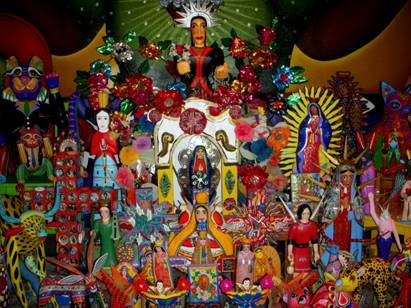 With a passion for Mexico and religious iconography, it’s no surprise to find a bowl of painted and adorned crosses on the coffee table. Why have one when 60 make a statement? 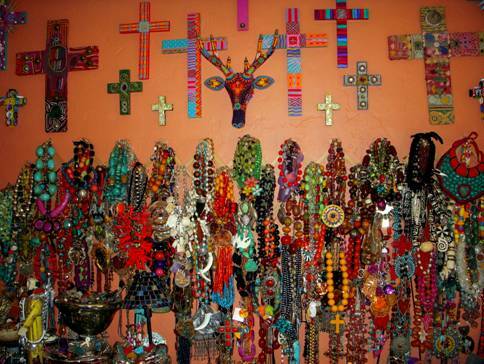 Coreen has been collecting ethnic jewelry for years; it’s her passion. When we first met, she was a professional make-up artist with a thriving business, regular television appearances, and an enviable client list of VIPs and celebrities. She also created and starred in training videos for a major corporation, as well as assisting them with product development. On sabbatical in Mexico after one hectic corporate season, she studied silversmith techniques, and began designing the jewelry she truly wanted but couldn’t find anywhere. Immediately people inquired where she acquired her pieces, then begged her to create pieces for them. 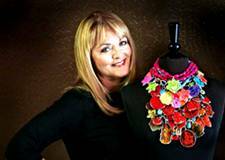 Today you can find her work in Neiman Marcus, Saks Fifth Avenue, and galleries in Santa Fe, San Francisco and elsewhere. Although she resides near San Francisco, she eventually built a home and studio in Mexico to house her design team and production equipment. 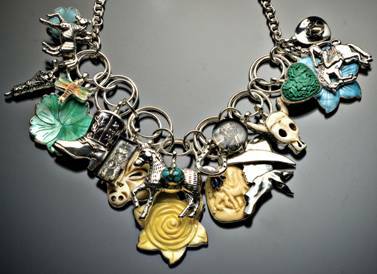 Her specialty is charm necklaces, which she’ll personalize for a client, mixing artifacts gathered from around the globe with her custom charms. Each necklace tells a story. New concepts continually pour from her imagination. She works endlessly, and always with joy and passion. 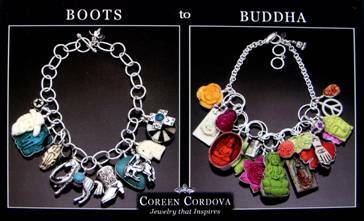 While admiring a client necklace awash in buddhas of every shape, color and size, it hit me…”Coreen” I exclaimed, “do you realize what you’ve done? You’ve just started your client on their own mini-collection.” She laughed. “I can’t help it. That’s how I think.” This artist is making Accidental Collectors of a whole new generation of followers. Custom creation for a yellow rose of Texas with blue-green eyes. Indeed, one friend chided “Coreen, your work runs the gamut from boot scootin’ to Buddha” so naturally, her next marketing piece said exactly that. When you wear a Cordova piece, you become a collector by association, whether it be a bevvy of Buddhas or corral of carousin’ cowboys. Terrific fun! It’s always gratifying when you can find a handkerchief the feels customized for the recipient. 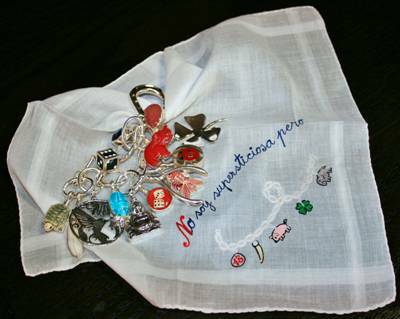 Coreen sells a very popular combination “superstition & good luck” bracelet, so when I found this hankie embroidered with good luck charms that proclaims in Spanish “I’m not superstitious, but…” I knew who had to have it. 🙂 Many of the handkerchief images actually correspond to the charms on her bracelet. Such a colorful collector and a beautifully written story, Ann! 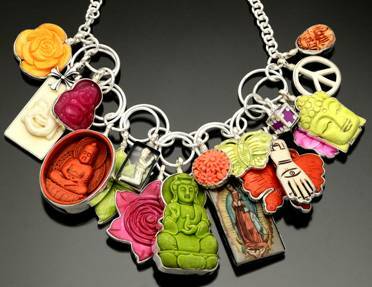 I love the photos of Coreen’s brilliant eclectic charms and collectibles from Mexico. Very enjoyable! She’s one of a kind, and so are her creations.